The images below are actual "before" and "immediately after" photos of permanent makeup applications that I performed at my Studio. The most important step in creating beautiful eyebrows is the design. It is extremely important to draw them first with a brow pencil before applying the color permanently. That way, any adjustments can be made to make sure that the brows are exactly in line with the client's expectations and personal design preferences. The eyebrows below are a few examples of Microblading technique. natural looking eyebrows, regardless of your ethnic background, skin tone or hair color. From 'soft and light' to 'thicker and bolder,' the results are stunning! Some clients prefer to have multiple procedures done during the same visit. The main advantage to having two or more treatments at once is the healing time and the after care: it all happens at once. Also, the number of visits for the first and follow-up applications are greatly reduced. My approach to eyeliners is similar to eyebrows in that understanding the client's preference and expectation are critical. 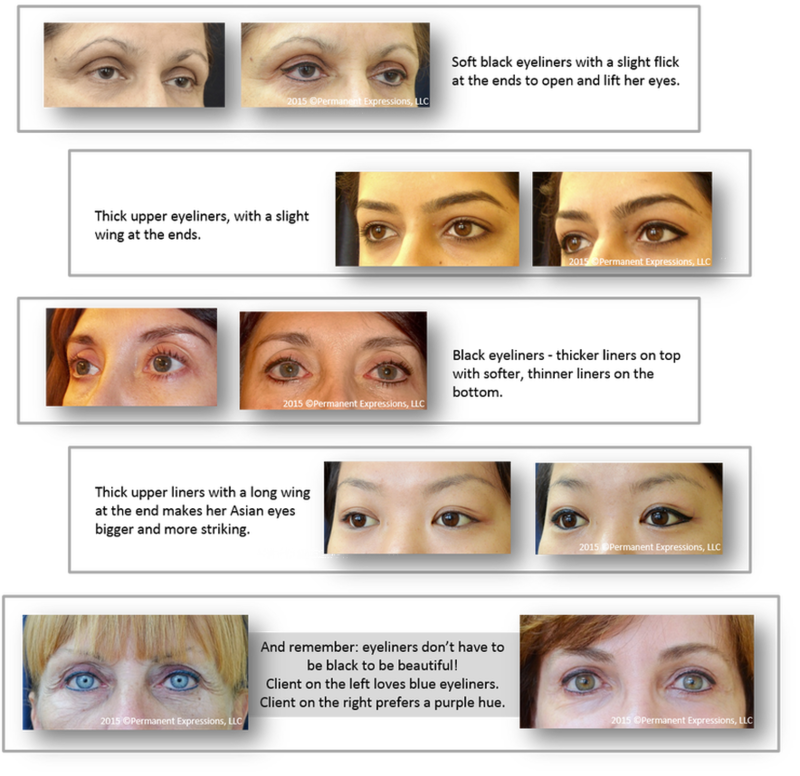 The shape of the eyes and ethnicity play a big role in determining the optimum design. For instance, the tail of the eyeliner can vary from a sharp edge to a softer and more rounded edge, or it can end in a flicked or winged tail. Also, my clients can choose from an abundance of colors, ranging from blacks to browns and every shade in between, as well as some of the most popular eyeshadows in greens, purples and blues. I enjoy doing lips - they add so much color and beauty to our expressions. In terms of my approach, as always, the color and design are entirely up to the client. As you can see in the pictures below, the transformation is amazing! The following pictures were taken immediately after the procedure, so the final results will be softer. However, permanent cosmetics can restore dull and thinning lips into sexier, more luscious lips.